When you move to Tokyo from New York you go a bit ramen mad. It is to be expected. There are glorious bowls of ramen EVERYWHERE and it is so much better and so much cheaper than the best ramen in New York that you can easily spend your first two weeks here eating a bowl a day…which I did. My stomach was happy. My self-image was not. After that madness cools a bit, you start becoming critical and developing standards. For me, I like simplicity. I like a pork or chicken based broth that reveals itself in layers. I like a shoyu flavor. I want my ramen blazingly hot. I want my nose to run while eating it. I want my egg to be runny. I want my pork to be tender. I want my noodles springy. I want steamy windows. So far, a month into my new Tokyo life, I’ve had some very good ramen and one excellent ramen (which I will report on later!). I had noticed Inoko Ramen on the way to my subway stop in Hewaidai (Do or Die Hewaidai as I like to call it). It always has a big line, and I had shakily avoided crashing my bike into hungry folks on a few occasions (I’m not quite used to this whole sidewalk riding style). Well, today was the day to try, so I waited in a nice, hefty line. A big wait gets you hyped when you are hungry as it hones your appetite and your expectations. Well…We finally got in and I ordered the regular shoyu raman with an egg. Perhaps based on a love for the movie Tampopo, I indulge in a little ritual when I get my bowl. I give the noodles a swirl, lift a piece of pork — sort of giving it a welcome, and, dipping it back into the broth, a nod that I will see it again soon — and make sure the accompniments, such as green onion (and spinich in the case of Inoko) are well spread. And then I take a sip of the broth. Inoko has a very very rich pork broth, almost gelatinous: the type of broth you know will sit in your stomach like a cinder block. I added a bit of garlic to the soup and slurped up the noodles. Disappointment. The noodles were not the proper temperature and maybe a bit under-cooked. After a few slurps of noodle, I tasted the pork. Very fatty and oddly bland. More noodles and then split my egg in half. Properly runny but a bit cold — which really bugs me (my wife complained that her bamboo shoots were cold as well). i finished the ramen, and lifted the bowl to my lips to finish off the soup — because I am still at that point that a so-so ramen is still pretty damn good. 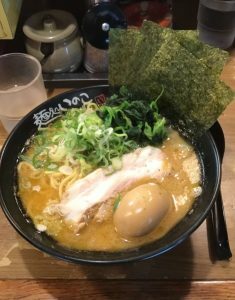 Inoko offers a bunch of odd ramen choices — a tomato sauce based Tsukomen style ramen, a shrimp something ramen and a soupless ramen which i noticed two teenagers happily eating with the odd accompiniment of mayonaise. But, I will not return to try any of those things! Life is too short for a not super yummy bowl of ramen!